July 2015: We are on a new host! The previous host appears to have gone to a less expensive support contractor and many problems popped up that could not be resolved very easily. Further the user reviews indicated that confidence in the host had dropped to a very low level after having been one of the best when we started six years ago. One of the unexpected improvements is that the new server appears to run a lot faster, so folks using the sight picture utility will find it a lot more responsive! Added July 2014: Recommended Bullet Weight Calculator to be used as a compliment to the tables in the “Ideal Bullet Weight Calculator. Many of us have an idea of what rifles and bullet weights are best for hunting game like antelope, deer, elk, and hogs with our favorite hunting rifles. For example, the .243 Winchester with its 90-100 gr bullets has built a reputation as a deer harvester but tends to struggle a bit on the larger deer. 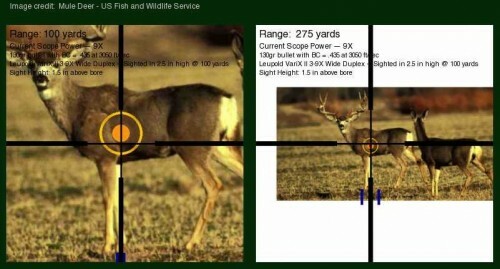 The .270 and its 130 gr bullets does well on all classes of deer and is marginal for elk, and so on. This understanding is based on a lot of factors including peer advice, reading, and personal experience. Nonetheless, many folks choose bullets and calibers that produce so much recoil that they are challenged to get the bullet to hit within the vital zone of their quarry. Others minimize recoil by choosing small caliber rifles or medium bore guns with lightweight bullets better classified as varmint bullets. Is there a happy in-between in weight and power that can be described as ideal for the intended quarry? Table 1. Minimum bullet Weight versus Body Mass of Typical North American Medium Game. Impact velocity must be within manufacturer’s recommended range and the shot must go into the vital zone and within about 30 degrees of the side. Valid for most bullets for impact velocities between 2000 and 3000 fps. Whenever a new powder or bullet appears on the market, folks have to wait a long time for commercially vetted load data unless they happen to shoot one of the popular calibers. Powder and bullet companies target their powder for these calibers. Similarly, long-range target shooters frequently press the maximum load ceiling to get the slight added performance edge that can make the difference between winning or losing a contest. How do you work up safe loads when you happen to be in one or both of these groups? Go here to read a discussion about finding out when pressures might be too high. Your favorite rifle is sighted to point of aim at 100 yards and that pesky deer shows up at 275 yards. What is the sight picture needed to center in the vital zone? 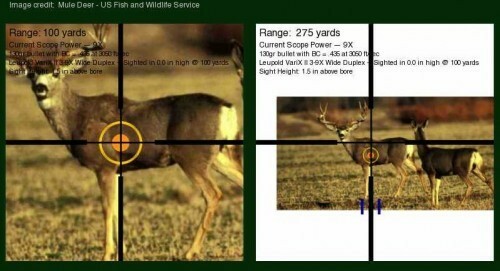 The cross hairs need to be near the spine when shooting at 250 yards. Is the sight picture easier to use if the rifle was sighted in 2.5 inches high at 100 yards? Rifle sighted in 2.5 inches high at 100 yards. Sighting 2.5 inches high at 100 yds allows you to have a more consistent hold for these ranges. Build sight pictures from example trajectories: Demo. Here’s to Safe & Fun Shooting! Copyright ©2009, 2011 Las Positas Group, LLC. All copyrightable text and graphics, the selection, arrangement, and presentation of all materials, the overall design of this web site and the underlying software are all ©2009, 2011 Las Positas Group, LLC. All rights reserved. Permission is granted to download and print materials from this website for the purpose of viewing, reading, and retaining for reference. Any other copying, distribution, retransmission, modification of information, tools, and/or materials on this site, or the commercial use of any information, materials and/or tools on this website, whether in electronic or hard copy form, without the express prior written permission of Las Positas Group, LLC, is strictly prohibited.